Tad Xay and Pha Xay (‘Tad’ and ‘Pha’ respectively mean ‘waterfall’ and ‘cliff’) may arguably be the most beautiful ‘twin’ waterfall in Phou Khao Khouay, particularly during the rainy season. The Houey Xay stream has its source in the northern mountains of the park, meanders through dense and relatively untouched evergreen forest and empties finally into the Nam Mang. By reaching Tad Xay, its crystal clear waters are cascading over seven 1- to 3-meter steps. The water then flows through a picturesque valley for about 800 meters before plunging over another steep 40-meter cliff (Pha Xay). 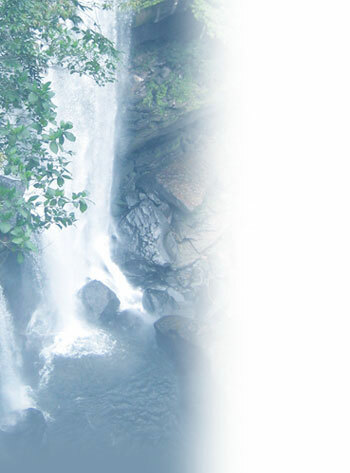 It falls into a breathtaking gorge surrounded by dense forest. The amount of water varies considerably with the seasons: being calm and gentle during the months of December to May, the river may turn into a wild and torrent thus dangerous river for the rest of the year. Two trails are marked with coloured triangles: one (white-red) trail enters the forest about 100 meters before you reach the parking area (where the incoming road turns left) and ends at the near-by viewpoint almost in front of Pha Xay. The other one (yellow-red) guides you to Tad Xay after crossing the small bridge at the parking area. A large pool filled with water all year round at the foot of Tad Xay invites visitors for a refreshing bath. 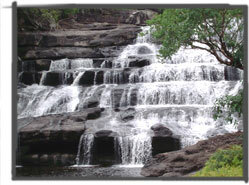 During the dry season you may also cross the river itself and walk up-stream inside the sandstone riverbed to Tad Xay. If you walk in the riverbed to Pha Xay (about 200 meters away) on the right (dry season only! ), watch your steps – it can be hazardous! The magnificent viewpoint doesn’t have a safety fence as of now and has to be approached with ultimate care. Remember, it’s going down 40 meters straight and it can be very slippery when wet! The evergreen forest here is still good and harbours a great deal of wildlife – but you have to be more than patient and lucky to see any of the larger animals (such as primates)! Birds may be silent during daytime but it gets ‘noisier’ in the evening or at dawn. Colourful butterflies fill the air with romance during the rainy season. The area is also rewarding for its abundant orchids, ferns and flowering plants, the latter particularly at the more open places, filling the surrounding air with a special, ‘bewitching’ scent. 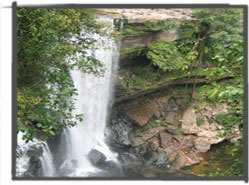 The twin falls are relatively easy accessible by car or motorbike from Vientiane via National Road No. 13 (South). Turn left at Km 90, short before entering Thabok. The road then leads to Ban Houay Leuk (after 5 kilometres). Follow the signs and turn right just 1 kilometre after this village (and crossing an iron bridge over the Nam Leuk). Pass the village of Ban Hatkhai, just two kilometres away. The rest of road (about 7 kilometres long) inside the forest may occasionally get a bit rough and steep. In the rainy season the road can be partially muddy and slippery. Instead of using a car up to Tad Xay/Pha Xay, it is highly recommended to opt for a rewarding and relatively easy combined boat and trekking tour. This trip will start in Ban Hakhai and can be directly organized there. A 45-minute boat trip will take you to the bottom of the mountain. From there the waterfalls are just an hour-walk away. Pre-arranged tours can be booked through various tour operators in Vientiane. Ban Hatkhai can also be reached by boat from Thabok in a bit more than an hour. It’s not a regular tour so you must find someone to bring you there and negotiate for the price. Public transportation from Vientiane is available from the southern bus station (km 8). These busses will pass Thabok, where you have to disembark and fetch one of the often over-crowded “Pick-ups or carries” heading for Long Xan. From a junction short after Ban Houay Leuk (ca. 6 km from Thabok, watch the sign board) you have to walk to Ban Hatkhai. The most comfortable way is to hire a vehicle with driver, which can be provided by various tour operators in Vientiane. It is possible to stay overnight in a home-stay in the village of Ban Hatkhai, from where you can do a trekking to the waterfalls or other places like Pha Luang. Camping at Tad Xay may exceptionally be allowed after consulting the park authorities. For further information, please contact the National Tourism Administration in Vientiane. Otherwise, you may opt for camping at the nearby Tad Leuk. In the center of Ban Thakok are two small guesthouses.